This Crock Pot Sausage, Green Beans and Potatoes is our foolproof, family favorite! 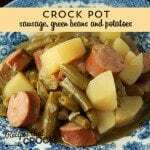 For this Crock Pot Sausage, Green Beans and Potatoes, I used my Travel Crock Pot. You will want to use a 5-6 quart crock pot for the full recipe. If you only have a smaller crock pot, I would recommend cutting this recipe in half because the full recipe definitely needs a large crock pot.